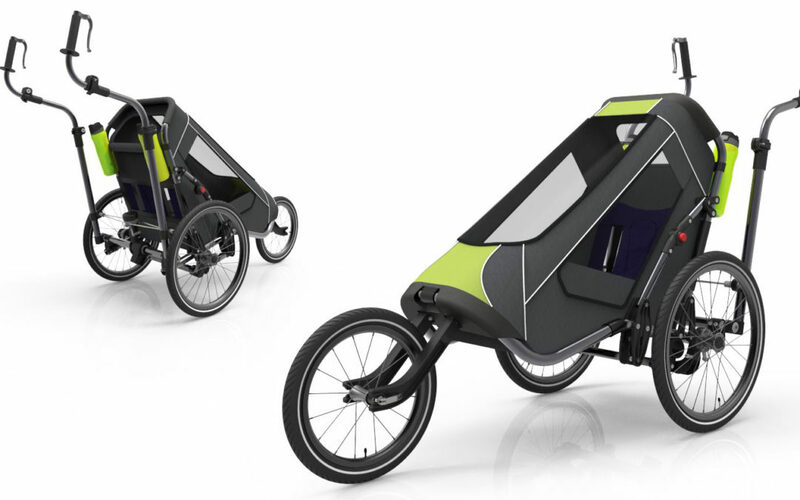 JogAlong Stroller is exactly what you think when you hear the name–a stroller you can jog along with. However, it’s a stroller that embraces the body’s natural movements when walking or running. Unlike typical strollers, the arms of a JogAlong stroller move to match your movement. The challenge was demonstrating this to customers in the visuals. Throughout development and communication of their innovative design, JogAlong used KeyShot for imagery, animations and interactive views of the stroller on their website. KeyShot has been very helpful throughout the design process. In the early stages it allowed us to make quick changes in the CAD model and render it within a single day, whereas ordering and fitting up parts could have easily taken weeks. KeyShot helped increased the number of design iterations while shortening the overall process. Now, a year later, we are using KeyShot very heavily for the JogAlong website. The versatility of rendering single images, animations, and KeyShotVRs makes for a very immersive design. 1. Arm Animation (HOME page) – The first rendered image of the stroller is an animation showing the Jogalong’s arms moving – this really highlights what sets this stroller apart from any other jogging stroller – ergonomic handles that move freely with your natural arm movement. 2. Triple Stroller VR (HOME page) – Putting all three of the included kits (jogging, casters, and bike trailer) into one interactive element allows the customer to compare the three kits side by side in a way that was never possible before. 3. How it Works (SHOP page) – KeyShot makes it very easy to replicate views of the different kits. We were able to quickly hide/unhide components to go from one kit to another, while reusing saved cameras to create the six renders very quickly. 4. Roll-in Animations (ERGONOMIC DESIGN page) – After looking at the initial page design with static images of the stroller, we felt it really needed some sort of “pop”. That “pop” ended up as animations of the stroller rolling in from the side of the page.